Human consumption of resources isn’t clean. We produce waste in manufacturing of products, and also in the aftermath of their use, be it from food that is quickly consumed or from other products that eventually stop being used or are no longer functional. A lot ends up in garbage landfills. The last 100 years has seen an increase in waste like never before. In efforts to reduce the amount of waste in our lives, we can become more minimalistic and have less things in our lives. We can buy less, and then we use less. We can share with others as well. 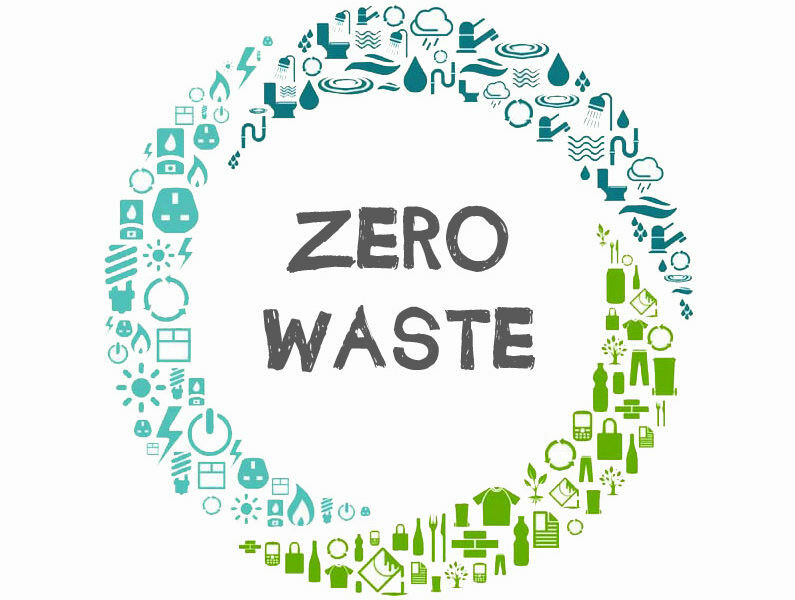 SourceZero waste is a lifestyle philosophy that encourages a reduction in waste as well by redesigning the life cycle of resources. The goal is to reduce the amount of trash sent to landfills to reach a zero waste footprint. This can be difficult to do, but that doesn’t mean we can’t work towards that ideal and get better at it as we make an effort to do so. As you can see, adopting a zero waste lifestyle is in our own best interest. The pollution of the planet is a problem we have created, and it’s up to us to fix things. We’re not only harming ourselves in our mad dominance of everything, but other earthlings (animal beings) who have just as much right to exist on earth as we do. In the past 20 years, there has been a steady increase in the amount of municipalities that have adopted recycling programs. 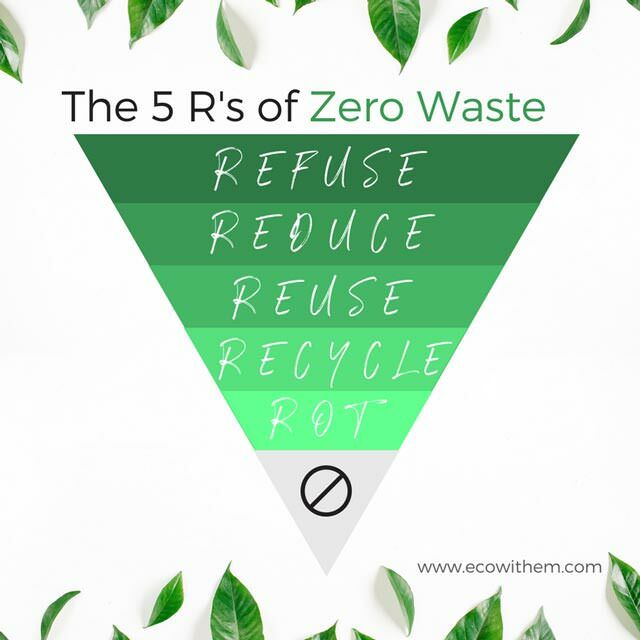 We already employ one of the 5 R’s of zero waste philosophy, to some extent. Although, most of us can do a better job of actually recycling and not just dumping things in the garbage. Say no to using non-recyclable products in order to eliminate most of your trash and recycling material. Don’t use paper or plastic bags, bring reusable bags. Don’t buy food wrapped in plastic. The more we buy of these things, the more it signal’s that it’s OK and the more it will keep going on being produced in the same way. Stop buying more things that you don’t or hardly use. Give away what you don’t use and never will use to others who can make use of it. Have too many clothes? Too many shoes? Too many of anything? We buy on impulse because we like something at the time, but then hardly or never use it later on. It just takes up space in your home, without adding value to your life. Let someone else have it if they have a use for it since you don’t. Good Will, Craigslist or Facebook groups are places you can give away or resell your stuff to someone else who can make good use of it. Think of simplifying your life. In the future, focus more on needs and less on wants with self-control over what you buy. Be more practical. A lot is disposable and doesn’t have a second life. It just ends up in the garbage or recycling at best. We spend money for things that don’t last. Money gets wasted in addition to the material. Shopping bags can be replaced with reusable bags that last for years. Just bring them. When going to restaurants, you can bring your own tupperware if they give you disposable packaging. It might be an inconvenience for them, but it helps cut down on waste for you, and their bottom line, as they don’t need to spend as much in packaging costs. It’s a win-win. Use containers at home for left-over food, rather than wrap things in plastic wrap. Instead of buying bottled water, buy a water filter and use a water bottle over and over. There are many other ways we can reuse products rather than be part of a disposable lifestyle. If something breaks or gets damaged, don’t just go buy another. See if you can repair it. Clothes can be mended with sewing. We don’t need to own so much stuff, we can borrow, exchange and trade with people as well. Second hand items like clothes, movies, music, books and tools can all be part of a change of lifestyle to reduce consumption and waste of resources. This is the last part after you refuse to buy things, reduce your consumption, and reuse or repair what you have. There will only be a little left to recycle. Be mindful of what can be recycled, and don’t just throw it in the trash. Anything that is biological/organic, should not be thrown in the garbage. In most cities there is compost collection. If not, see if you can organize a community effort with people to lobby for a compost program to be added. If you have a backyard in the city or country, composting shouldn’t be an issue. Just put the food waste into a pile and let it rot. Or learn how to compost better with covering like straw/hay or tarps to get the process to move along quicker. Start to grow a garden with your own food, and use the compost to enrich the soil. This will save money on food and composting for the garden. I was already pretty conscious of my consumption, being somewhat minimalistic in my way of living. I was already recycling all that could be, and I composted all biological material. But, last year there was a zero waste festival in Montreal. My girlfriend and I have similar life goals, and she wanted to go, so we went. I learned some more things to do to help me lessen my contribution to waste. I hope this information interests you to try to improve your reduction on waste.